The staff, volunteers and board members who make it all work. Sauvie Island Center is run by a small staff and a board of directors. In addition, we are supported by a robust team of volunteers who are the backbone of our organization. Simply put, we would not be able to do what we do without them. 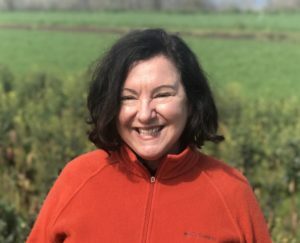 Joanne Lazo joined the Sauvie Island Center staff in March of 2011 as Marketing Manager and was promoted to Executive Director in July of 2018. She grew up in the Pacific Northwest where her first job was picking strawberries on the small farms that dotted the hills west of Salem. After graduating from the University of Oregon and spending several post-college years working in advertising in New York City, the beauty and bounty of Oregon called her home. Recently, Joanne served as Marketing Director for the Portland Le Cordon Bleu College of Culinary Arts, where she developed and administered the school’s corporate giving program. Joanne has always been committed to community service, volunteering with the Volunteer Action Committee of Eugene while in college. In New York she spent time tutoring kids at a homeless shelter near her apartment. When she returned to Oregon, Joanne gave her time to a variety of education-based non-profit organizations. Working with the Sauvie Island Center allows Joanne to merge her two passions: commitment to community and a love of fresh, local food. Jules Montes moved to Portland 9 years ago from North Carolina. Following her passion for health and wellness she became a certified yoga teacher, completed an organic farming apprenticeship through OSU Extension, and is pursing a BS in Community Health Education with a minor in Graphic Design. Since 2014 she has worked with the Sauvie Island Center in multiple roles including lead educator, summer camp counselor, managing the Grow Lunch Garden, volunteer coordinator, and promoting community engagement. Jules brings enthusiasm for connecting children and communities to land stewardship and to organic produce. Her favorite thing about working with the Sauvie Island Center is seeing kids’ excitement when they taste fresh vegetables straight from the Grow Lunch Garden! When she’s not on the farm, Jules enjoys yoga, backpacking, rock climbing, digital and film photography, and playing the ukulele. Read all about our Board of Directors here. The Sauvie Island Center is thriving thanks to the hard work of our talented and dedicated volunteers! Click here for a list of our current volunteers. Each season we profile a few of our outstanding volunteers in our Volunteer Spotlight. Are you passionate about gardening, nature, or working outdoors with children? If so, consider volunteering with Sauvie Island Center! Volunteers lead small groups of elementary school students through interactive, hands-on, farm-based lessons on plant life cycles, soil science, pollination, and more. Learn about volunteer opportunities here.